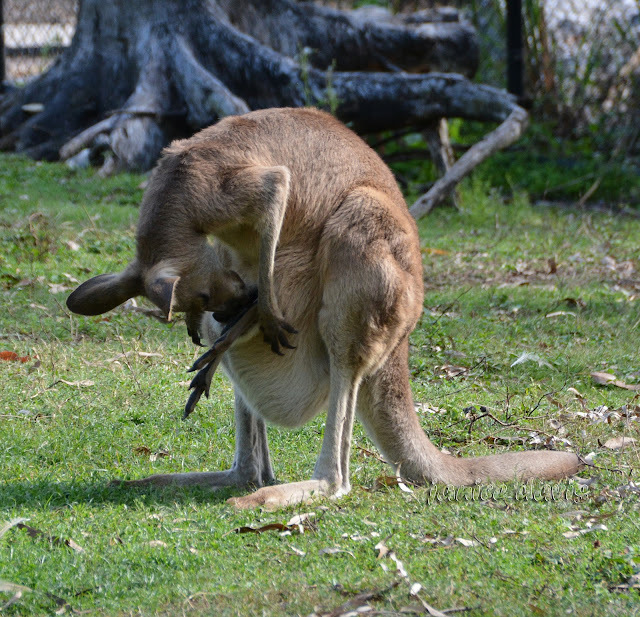 thoughts & happenings: Kangaroos and such. 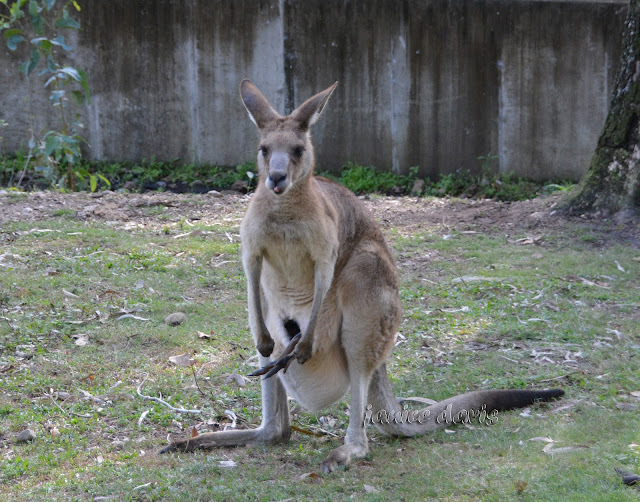 The Rockhampton Zoo was a place we visited and enjoyed. Not a good variety of animals but a pleasant afternoon. A few years ago the park and many animals were destroyed due to a Cyclone that went through the area. Crocodile and below a Koala which was well hidden from view, just managed to snap at the right time. When first looking at that croc we thought it was dead, but no it did move it's jaw! Good shots, I was at a zoo in Atlanta, Georgia USA and most of the animals were inactive and hard to spot. Do know what you mean about animals in the zoo, have struck this myself several times. Love the koala. And the pouch potato in that poor kangaroos pouch. Seemed to be a rather large Joey but they are all legs. Friendly, kangaroos and beautiful koalas. The crocodile, is for see it quite far. That crocodile was a good way away from us, we were up high on a boardwalk. Those are great photos. 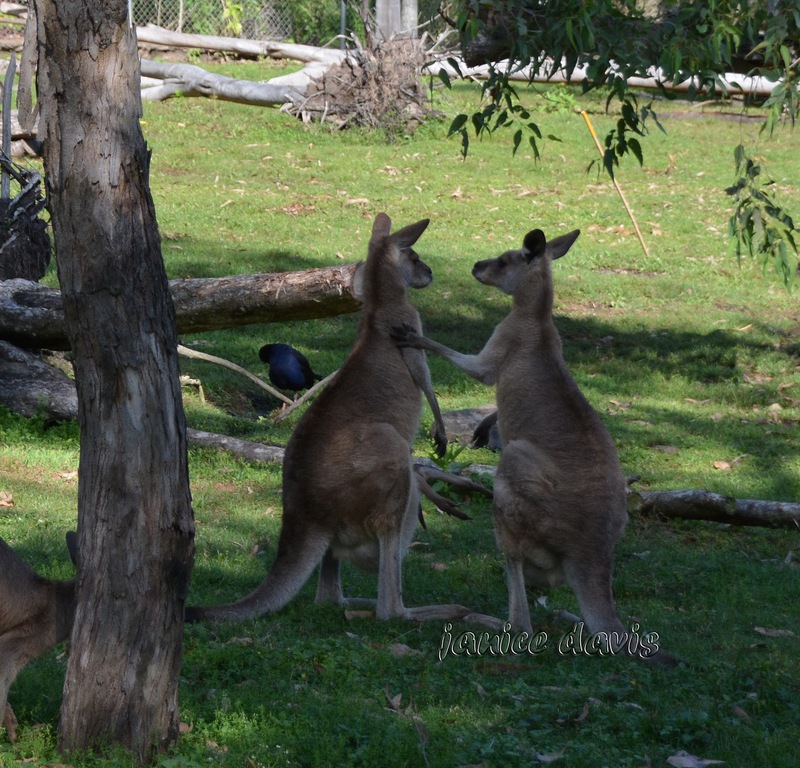 The first two Roos look like friends having a natter, and the mama looking for the Joey in her pouch is just perfect. Nice to see the koala up close. Whenever I have spotted them in a zoo here they are up so high in the foliage they are nearly invisible. Rather a big Joey at that too, well they are all legs anyway. 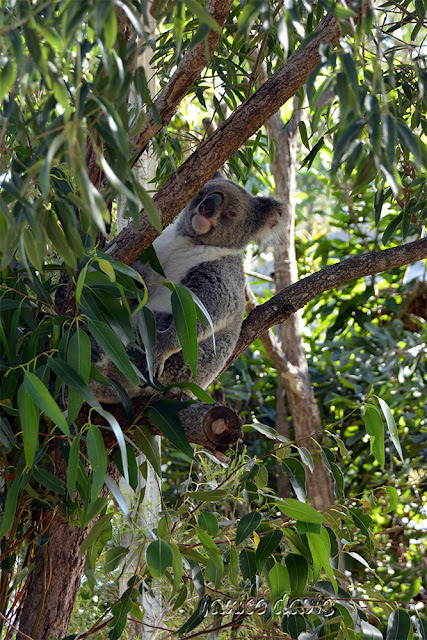 That was about the first time I managed to get a rather decent photo of a koala, like you they are hard to see in a tree. Friends having a natter for sure! I love the way the one is touching the other on the shoulder. Great pictures! Thanks Bill. Was waiting there for an ok shot and got one that I was rather pleased with. Very sweet pictures. I would love to visit there. Nice surrounds there with the Botanic Gardens next door I'm sure you would love that. The first roo pic looks like they're just two mates hanging out for a chat. Priceless really and we have no idea what they are saying, can only imagine. Wow! What a great surprise. Thanks for these hopping wonders. Lovely pictures, those first two kangaroos look like a pair of gossiping aunties. Great shots of our iconic animals. Trust you are both well. Lovely photos, It's hard to get pictures of koalas that one is a beauty. I had myself on a rather weird angle to take that photo of koala, he was on the move upwards. All great photo's, I especially like your first and last. Thanks Jan, always interesting when trying to take shots of animals. at a distance or ELSE! Well that was wonderful you could spend time with your mother on Mother's Day Colin. I love Kangaroos, and the Koala, great photos. Thanks Sussi - they do look ever so cute. Rockhampton park looks like a wonderful place to spend sometime with animals. i am so fond of kangaroos so these shots are my desire ! How sweet to have pocket for their young ones God is great indeed! your lenses are powerful to caught koala so well. Crocodiles are clever as your camera show this too . Pleased you liked them 'baili', there are so many lovely markings on the different varieties of kangaroos, it's amazing. I love these pictures, especially the roos. How fun. Good to see them for me also Sandra. I notice that the species you feature are all native. Is this zoo devoted to Australian fauna? Yes David, most animals there are native, a few monkeys that are not native, and there were a few birds that were not native but they died in the cyclone a few years ago. I love how the kangaroos seem to be having a really cosy heart to heart in your first photo! The koala must have been playing peekaboo with you! Thanks Christine. The animals were wonderful to see and photograph. Beautiful, beautiful shot.. But the baby kangaroo didn't show its face..
No the joey didn't show it's face, they are know doubt too comfortable to come out. Olá, visitar um parque animal é sempre uma boa opção, assim é possível apreciar a beleza e os seus movimentos, as fotos são excelentes. Thanks. It's not always possible to visit a zoo for there are not that many of them in Australia. We have some in a few of our Capital cities but then not all cities have one. You see wonderful animals in your county. The kangaroos are so very lovely ! !